Donna's Crafty Place: Exciting News!!! They've started announcing World Card Making Day Contest Winners over at the Paper Crafts and Scrapbooking Magazine Blog and I'm thrilled to share that I was a winner in the Love Category!!! I have to say that I was stunned and honored when I got the e-mail. The card will be in the It's been so hard to keep this a secret from my crafty friends and I'm so glad the cat is finally out of the bag!! I entered two cards that and I thought I would share the one that was not a "winner". It was so much fun to make and I love the colors. The star is from the Unity March 2014 SMAK Kit. I used Distress Inks with water. The "thanks" is a Lawn Fawn die. The paper is Hawaiin Shores from Papertrey Ink. It says exactly what I want to say Thanks!!!! Super cute card and congrats!! Yay!! I am so happy for you, Donna! HUGE congrats! It's high time that you get a well-deserved recognition. 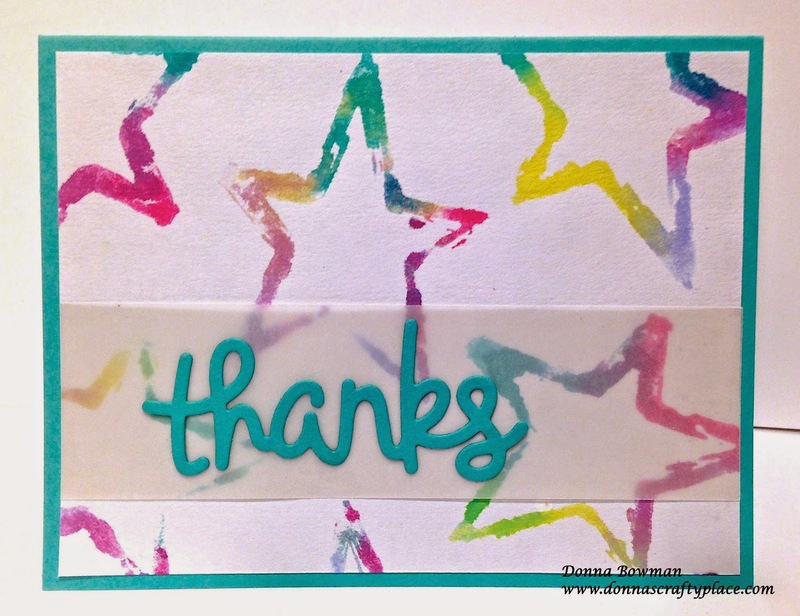 This Thank You card is full of colors! FABULOUS! Way to go, Donna! Love this card and I can't wait to see your "love" card when the WCMD issue comes out! Well done you, I saw your name in the blog announcement and was soooo happy for you GF! Congrats on on being a winner! I love the colours on this card! MANY big congrats! Hope you enjoy your swag!